We will not be posting this weekend. Hopfuly we will be able to post on Monday. If you wish to contact us then please still do and we will get back to you as soon as we can. Thank you! Dying Fetus to play two select shows in American this September. One in Clitfon, NJ at the Dingbatz on September 6th and the second in Amityville, NY at Revolution on September 7th. These shows will serve as the bands warm up shows for their upcoming European tour, 'The Womb to Waste'. Swedish bluesy rockers Graveyard have set Lights Out as the title for the group's next album, which is set to be released in Europe on October 26th and in North America on November 6th via Nuclear Blast, just one year after they released the trippy Hisingen Blues. Drummer Axel Sjöberg commented about the album title: "The title Lights Out sums up the feeling of the new album, and a feeling that we have. That these times that we live in are strange times, where no one really sees anything straight/the way they are." About the cover of the upcoming third album, Sjöberg added: "We all know that both we and pretty much everyone was really excited about the cover of Hisingen Blues. So we had to come up with a really strong idea to match the strength of that cover. It's just about finished now, but even without having seen the final version, we are convinced that no one will be disappointed by the cover to Lights Out. We've worked with several people that all added their part, and as the saying goes in Sweden: the sum of the parts is bigger than the parts alone. So sharpen your raven's hatches and get ready for Lights Out." How did the band come up with the band's name? "Well, at that time we wanted a name that would stand for what we all believe in and see things, so 'Corpse Garden' is actually that, our way of seeing the world. We are all corpses lying next to each others in a Garden, sharing space and feelings and interacting with each others"
Why did you start a Death Metal band? "Because that was the type of music we all liked: extreme metal, agressivity and technicallity." You shared the stage with Morbid Angle, What did the mean for the band and how was your expirence? "Sharing that stage with them was a big mix of emotions some of happines, pride and reward for making things right. Also, Morbid Angel is one of our influences so it was really nice to be able to be their opening act." What should some one expect your deput album "Burnt by the Lights" sound like? 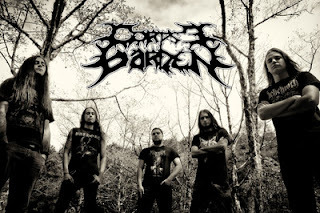 "I cannot really put it in words but if you are into Death Metal you wont be dissapointed." "It can be found physically and digital on Amazon.com and CD Baby and on iTunes as well but just digital." Why start a Grindcore band? "Well , I started PxFx around 1998 as a thrash metal band like the old Sepultura , few months later we turned into something shorter & easier to play , the first demo “Songs of pathological experience” was recorded . The reason is just we love fast & heavy music , grindcore is the best music ever to spread what we feel." How did you pick this name for the band? 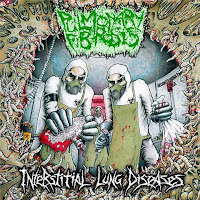 "In those glorious years of the Czech grind scene at the end of the 90’s , came too many awesome bands with one of the best recordings ever , Malignant Tumour was my favourite band at that time & I just found Pulmonary Fibrosis in their lyrics on their split cd with the almighty Squash Bowels." Your first album "Organ Maggots" was recorded in 2005 and released in 2007, Why the long wait to release it? "If I remember well , the label took a lot of time to release it." "I’m disappointed about how my drum sounds , also that our lazy guitarist didn’t record the basslines & as well about the missing part of the booklet . But the performance of Pascal was incredible." Do you have a favorite track of the album? "All of them are pretty good , but for sure “Hacked the human flesh” & “Turn water to pus” are my favourite ones & they was also great to play." 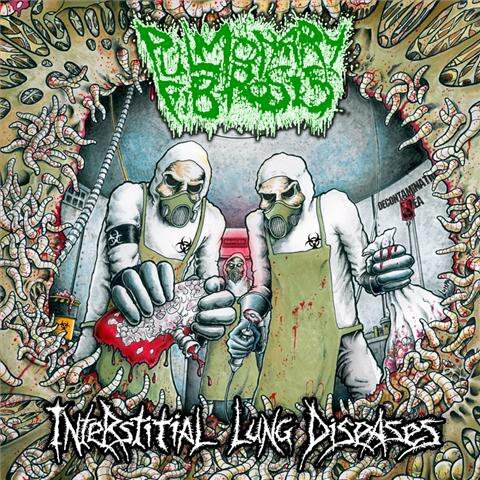 How does your 2nd album "Interstitial Lung Disease" differ from your first album? "That’s a real back to the roots , totally the way I started PxFx with gory influence & that’s grind , not a mix of all kind of music as we did in “Organ Maggots” . As well we are better musicians right now , the actual line-up is really good , old good friends playing sick grind , that’s our best effort ever . We also got a nice booklet with a great draw by my old friend Luisma from Haemorrhage." Can you give a short history of the band? "Wowww , I can’t really tell you something short , we still try touring all around the world , so you can expect lots of story & many bands know how it is . But I can tell you one who’s another story from all we had on our south american tour in September/October 2011 , where we spend almost 2 months . Well , we started as two pieces in Brazil (Yanosh & I) , we ended the tour in Brazil as well , but the last show in Brazil from the first part was in Florianopolis in the south of Brazil , we had to play in Argentina few days after , so we took a bus from Florianopolis till Buenos Aires & it took around 24 hours . That was a good experience héhé , but this tour was full of great time & story , like the others we made , maybe we could write a book , [..]"
Thoughts: One of the best albums of the year!! Classic Testament. 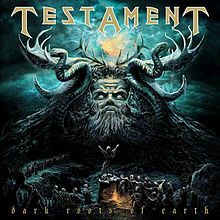 This album is one of the best Testament albums. Any Thrash Metal fans you need to get this album! ""Slayer" was allready used, so we've choosed "Intractable". No seriously, "Intractable" reflects our characters. For example, our drummers doctor told him"intractable" means in medical-terms "no chance for healing", [..]"
"hard to tell, we all listen to very different music. we're influenced by all kinds of good music." "career? did we missed the start? sriously. Till now we can't talk about a career. We hope to reach more people with our new CD. But at the moment, we're looking for a Label which help us to share our music arround the world!" Can you give some history about the band? "In the year of 2006 Dominic Meier (Git) and Benjamin Kottmann founded INTRACTABLE in SURSEE/LU. After a while Michael Schuler (Bass) and Markus Hospenthal (Git) joined them to complete the band. 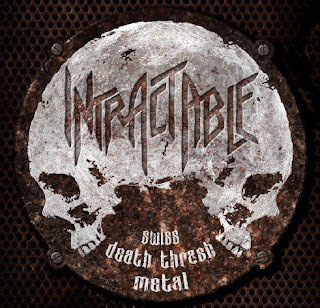 INTRACTABLE has been touring the stages of Switzerland since December 2009, from the small club shows up to bigger venues supporting such acts as: GURD, WARBRINGER; SKELLETON WITCH and many others. After the release of the first self-recorded Demo CD “First eruption” in spring 2010, which included 5 Songs, the band went into the studio to record our first album. With the 12 songs being mastered and the artwork in progress, the record is getting it’s finishing polish, to be released soon." What should some one expect to here off your album "inner decay"? How did the band come up with the band name? "Ahaha, actually we were totally drunk during one of the first time we met each other and Remi, our guitar player thought about this name, Vaginal Chicken, and we were like "hey why not ! ", this name came with the stupidity and incomprehension of this world, what's better than that..."
How would you describe you album "Hangover Chicken"? "The album was the beginning of the good tunes we created, before that it was a little bit less inspirated. And for sure it was the first stuff we released with a real sound ! In there we made some real groovy tunes, others more brutal, it was the beginning of some serious stuffs we made, that ends with our best CD, the split with Defecal Of Gerbe and Bestial Devastation "Grind Your Life", a masterpiece!" "I wouldn't speak about a special message, everything in our lyrics is about the madness of the world, and the way that a lot of people become crazy, kill everybody, etc. It has always been something which inspired me for the lyrics, that's really a fascinating subject." What makes your band different from all the other bands? "I don't know if we are really different from a lot bands, but maybe just in the way we always made our music, half serious, half fun, because i think that too many grindcore bands are just fun and others are really extreme, if i would choose of course i would be on the extreme side, but maybe more with a more modern approach of the grindcore music." You shared the stage with Y&T, how you expirence with that band? "Great! That was our first big-show in a big venue. We dident know anything about Y&T at that point, never really heard of them. But when we got the offer to be the support act we checked them out, and I was really surprised. They are one of my favorite bands now, they got so much. They have great metal-riffs in some songs, great ballads, amazing voice and every song is well written." It also looks like you ha ve tour with a lot of famous bands, is there a band/bands that you had the best expirence with? "We did a tour with LA Guns (tracii guns) in March this year. That was one of my favorit tours. Everybody was just so relaxed. And I belive that the bookers/promoters and agencys that was involved in this tour was much more serious than some others we have experienced." How do you feel about you deput album "Different Tomorrow"? "We got what we wanted. We wanted to record an album the way they did in the 70 & 80`s with alot of old analog studio gear, and we wanted to sound like they did in the 80`s too. We were really into all that stuff 2 years ago. But things have changed and we are writing much heavier songs now. Still with the "classic rock" sound but i think we have a much heavier sound for the next album, with a more modern touch." "I like them all, but Selling Your Soul has always been a favourite. "Without You" is also one of my favourite songs on that album." What was your/the bands reaction when you saw that your album went to number 4 in category Hard Rock on the Swedish charts? "That was great! at that point we`d been on the charts for several weeks. some weeks we were nr6, nr9, 13 etc. One week we were nr 4, that was cool!" As of right now you posted the band a currently working on their second album, how is that going as of right now? "We are currently putting the finishing touches on the last few songs. All the major parts are recorded and done so right now we are mostly getting ready for the photo and video shoot. If all goes to plan well have an early copy of the album by september and all fans can get their hands on it in october when it hits the stores." What should the fans expect the album to sound like? "A more modern take on our original classic rock sound with a bigger production then on "Different Tomorrow". Also the song writing is more organic and "effortless" these days. Essentially its the sound produced when the four of us get together to play." Dirty Passion to release their second album "...In Wonderland" this october. The hotly awaited 2nd album by Swedens hardest working band Dirty Passion has been confirmed for an October 2012 release. "Dirty Passion - In Wonderland" will be released world wide by "Denomination Records", a subsidiary of "Transubstans/Record Heaven". After 8 months of writing and playing the new material live, most notably on the Dirty Passion/L.A Guns Euro tour, The recording finally took place in july of 2012 and saw the band utilize 4 different studios including a return for the final mixing at the world-renowned "Roasting House Studios". After extensive radio play the critically acclaimed radio pre-single "When Darkness Falls" will also be included on the album as a speciall bonus track. This time around the band has decided to move in a more modern direction without losing sight of the fundamentals of the Dirty Passion sound, the melodies and catchy choruses. With a heavier sound and better production as well as a more diverse song writing approach the final result is a modern mix of classic rock and youthfull playfulness that is sure to please both old and new fans alike.